A Mother's heart journeys through a lifetime of experiencing joys and sorrows along the way. We carry the banner of love, understanding, wisdom gained, and a hope. What more can this Mother of three beautiful treasured daughters write about this special design? If you are familiar with the center pendant,"Born in Your Heart," then you already know about the healing and beauty that our amazing child's drawing has given to our family and the world. She was only five years old and new to our family when she would be carrying a burden too heavy for herself. She had questions that I could not satisfy with my answers. I believe that God gave her a visual gift and then she drew her Born in Your Heart from that gift. It certainly is a beautiful and masterful drawing that has touched many deeply. She had defined our love and "Motherhood." You can read more about our story and the projects that are being funded at www.borninyourheart.com. We added a circle around the hearts to represent eternity. Our hope is NOT with earthly things, it goes beyond. We love that you can build your own Mother's Heart just the way you want; it becomes your story. A beautiful and personal memory of your family. One that you will delight in sharing and passing down. We hope that you will enjoy the awe, beauty, and passion of her Born in Your Heart, " A Mother's Heart Collection." But that is not all! We added inspirational words that will remind you to pray,have patience, and treasure your family.Each oval tag has a saying on each side. Three oval tags reading: Faith/Dream, Love/Born in Your Heart tm, and Hope/Family. We also added a wee Trinity knot to represent God. AND now let's add your birthstones. You pick what months you want to add below and we will add them for you. I chose to do a bracelet for me and then one for each of our daughters as a "Family bracelet." So,please make it your own. Let's. Each bracelet comes with the main Mother's Heart Charm, and then four small charms on the side. 3. 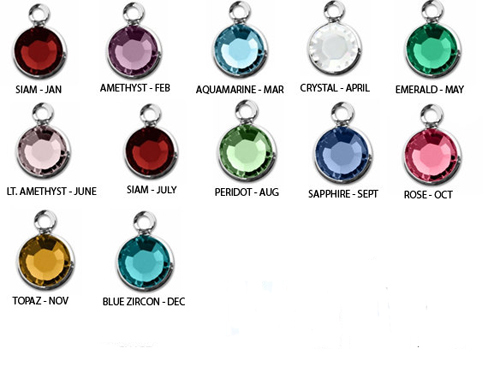 If you want your birthstones put on in a paritcular order, please leave us a note during check-out in the note section.